We know that countries, continents, regions and states have genders in French. See Continents, countries, regions & states are masculine, feminine or plural (gender). La France est un merveilleux pays. France is a wonderful country. J'adore le Portugal et l'Italie. I love Portugal and Italy. Les Etats-Unis sont un immense pays. The United States is a huge country. Je déteste la Californie ou la Provence. I hate California or Provence. Notice that in French, countries/continents/states/regions are used with the definite article le, la, l' or les, when used in general statements, unlike in English. When talking about going to or from a country, you won't use the definite article. See Using en with feminine countries and au(x) with masculine countries to say in or to (prepositions). I love Paris and London. 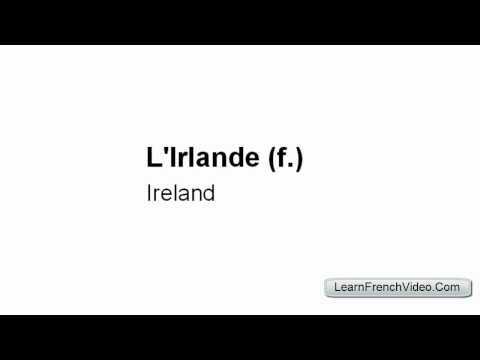 Le Pays de Galles, l'Écosse, l'Angleterre et l'Irlande du Nord font partie du Royaume-Uni. Wales, Scotland, England and Northern Ireland are part of the United Kingdom. Hello, I answered a questions that asked what the "Low Countries" were as "Les Pays-bas" which I learned in my French class, were the combination of The Netherlands, Luxembourg and Belgium. But the correct answer was The Netherlands event though the verb was "ont" and not "a" and the Netherlands is a single country. Could you tell me what the actual Low Countries would be in French? Hi Joanna, it's the same as in Englich: The Netherlands is formally plural even though it refers to a single country. I don't think it's the same as English. Generally we use a singular verb with countries like the Netherlands or the United States, but I suppose we'd use a plural verb with the Low Countries. I believe in French you would use "Les Pays-Bas" for both the Netherlands and the Low Countries, and always with a plural verb. Thank you for pointing this out Claudia . There is indeed a mistake in the video as it is- La Chine ( not La China) but as it is a third-party resource , we can't correct it . The largest category of countries in French are feminine ones. Those ending in 'ie' are normally feminine because of their latin root 'ia'. Often, when a country ends in a consonant, it will be masculine but not always, you may find exceptions to all of these rules. Here are some examples of countries who might appear to be feminine but are in fact masculine. i think the point is that in French 'ou' is used in this situation rather than 'et' - is that right? "I dislike California and Provence" is not the correct translation for "Je déteste la Californie ou la Provence". 'ou' could be used in this kind of sentence: "Je déteste le Sud: que ce soit la Californie ou la Provence"
Why is Israel in effect neutral gender? You mean, why it doesn't take an article? Good question. I am also waiting for Aurélies answer. But I'm afraid that there probably isn't a good reason except for "that's how it is". Do adjectives always come in front of the noun they describe? Peut on dire "La France est un pays merveilleux?" Hi Robert, the situation in French is a bit more varied. The vast majority of adjectives follows the noun. Then there are some which always come before the noun (e.g., grand, belle, nouveau, etc.). And then there are some which even change meaning depending on whether you put them before or after the noun. "Propre" means "one's own" when it vomes before the noun and "clean" when put after it. Best to study the exercises Gruff has posted. -- Chris (who is not a native speaker). Danemark or Le Danemark on the envelope? Bonjour Ben ! On an enveloppe, you'll simply add the name of the country on its own: "67, rue des Lilas 45 467 PIERREVILLE FRANCE" (This isn't a real address.... I think!) I hope that's helpful! À bientôt ! So, "J'habitais dans le Minnesota." and "Je viens du Minnesota." ? Oui, Bonnie, exactement ! Bravo, continue comme ça !